Despite chasing Giants and hot springs on your Icelandic Road Trip, it is possible you may be surprised one quiet night by a different kind of sight. A sight which many visitors eagerly look forward to on this island. Unexpectedly peering through the sky as you take a break outside from the late-night drive, 3 a.m. in the middle of nowhere, unannounced, they might just grace your adventure: the Northern Lights. … none of those thoughts pass through my mind. In the complete silence of a deserted gravel road, surrounded by mountains, I’m trying to understand what on Earth is happening. I only went out for a stretch. And in the dead of night, the sky is becoming lively. The reason why an adventurer such as yourself may be taken aback under this rare blanket of light, is that it looks nothing like what you’d expect. The tourist brochures have been lying to us! So drawing from my extremely limited experience, a few things need debunking, I find. First off, they’re not still. They’re not like on the brochures. Which I understand cannot flicker. But these Northern Lights certainly do. The sky, in parts, flares up in flashes, light spreading across the canopy of night and stars. These travel like waves, conveyed by heart-beat, sending pulsating clarity to glide over the stillest landscape. In other parts, the lights move like a cloud, slowly morphing, expanding or retracting. All this with a hint of fragility, as they can then disappear without the slightest notice. That one’s on me for subconsciously imagining a dancing sky would be accompanied by ‘swooshes’ ‘whoooshes’ and ‘vvvvvoooms’. They’re not. They’re really not. Transfixed by the eeriness above, the only sound you’ll hear for miles around, is your own boots on the gravel of the sleeping road. Crunch. Crunch crunch crunch. Crunch. And nothing more than silence. They don’t look green. There’s a huge difference between how we’re used to seeing them in Instagram or on “Come See cool Iceland Stuff in a Packed Bus” brochures, and how they actually look. That’s because the cells in our eyes that can detect fainter light (Rod cells) aren’t so good with colour, and the Aurora Borealis-es actually end up looking… GREY ! What human eyes actually see. Also #beautiful. At no point did I see green, blue, or see la vie en rose literally. However this may vary. If the sky is charged with colours enough that the bits in your head that see colour get switched on (that’s the eyes’ cone cells), then you may see certain colours with the Aurora. I guess. Not that I’ve seen it. An Icelandic lady who sold me postcards told me she saw purple ones a couple of times. That’s as reliable as my sources get. So they’re grey. But, also maybe, colourful, if 1. you’re really really lucky 2. if you modify your memories through exposure to the souvenir photos you’ve taken 3. if you develop the ability to see beyond the usual spectrum of human eyes, like superman. But why do they happen ? Why do the Northern Lights happen? We live on a planet called “Earth”. Lots of very exciting things are happening there, a few of which, I’ve tried to illustrate here. Our planet waltzes around everyone’s favourite star: the Sun! It’s quite hot. The Sun’s so hot, it goes on 365 dates a year with the Earth (badum tish). And it explodes a lot. And sends deadly solar wind our way at the end of the meal. But our planet’s pretty hot too! 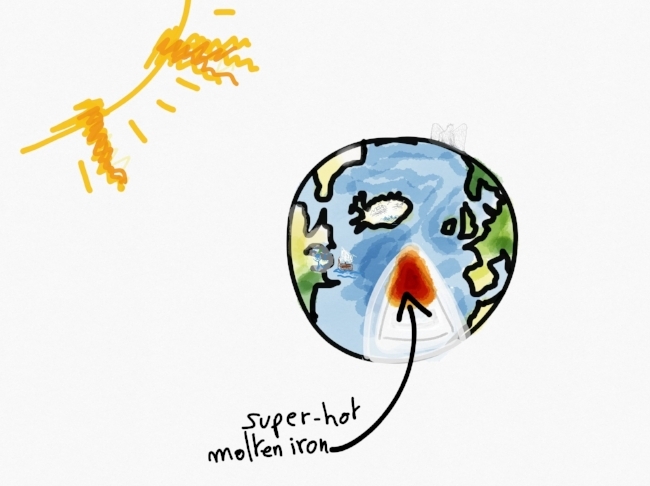 Inside it, there’s some molten (melted) iron in constant fusion! Hot. Luckily for life, giant Eagles and musical adventures, this molten (red hot) iron creates a magnetic shield. A bit like a ukulele bag for when it’s snowing. And this enables us to stay alive. Which is quite handy. However, the shield is weaker at the magnetic poles (top and bottom of Home). Meaning the sun’s radioactive storms -ions and electrons shooting through space- can sort of get through a bit over there as you get closer to the North and South end bits. As the sunny electrons fizz (silently) into our atmosphere, they rub and tango with molecules in the air (oxygen and nitrogen). The air’s molecules, rattled by the dance, then have to relieve the extra energy by emitting photons. Which we call light! The type of light emitted by the molecules varies according to altitude and ratio of gases present, and these variables are behind the different colours of the Aurora… that your camera can see. That is where the famous expression “Hit the rods, Jack” comes from. The Aurora Borealis, are, subjectively, fascinating to experience, but not necessarily for the (colourful) reasons they are such a sought-after sight. Rather than a dazzling dance of colours, they are a touching tribute to how little we know, or notice, about our everyday reality. The particles shooting above Iceland, are shooting all across the solar system and beyond, every single second. We are also unknowingly bombarded by millions of particles, wherever we are sat or standing, whatever we are doing, despite the magnetosphere. It’s just that comparatively with how much is happening, our sense of sight operates on a pretty limited range. And seeing the sky flicker, standing underneath thousand of stars a late night in Iceland is, most of all, an inspiring reminder to how much unseen drama is actually going on everywhere, always. Imagine if I had a really good camera ? This article would have been amazin’. The drawings are top shelf though. This lucky adventure of light and sound is propelled by Kuku campers, the nicest peoples with vans and cars that you can rent, and CloudMusic Ukuleles, whose hearty ukuleles I strum along the cold adventure. But not during Northern Lights. I just look when those happen.